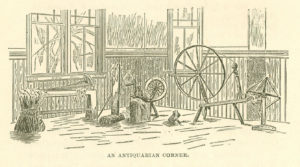 An Antiquarian Corner from Historic Rehoboth: Record of the Dedication of Goff Memorial Hall (1886), 26. The flax breaker, hatchel, and flax wheel in the Museum’s collection were considered some of the most significant artifacts to the founders of the Rehoboth Antiquarian Society. 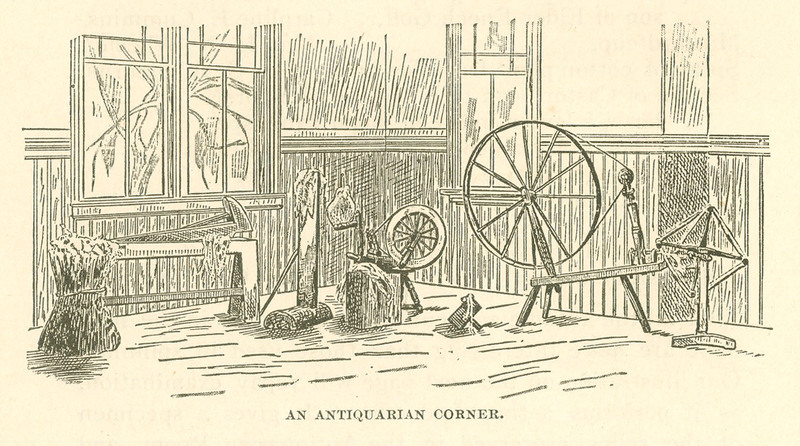 They created a special exhibit on spinning in one corner of the Antiquarian Room at the new Goff Memorial Hall, which they illustrated and explained in great detail in Historic Rehoboth: Record of the Dedication of Goff Memorial Hall (1886). The book also chronicles a program that took place on April 23, 1886, when several older residents, “whose combined ages were 464,” demonstrated the “lost arts” of preparing and spinning flax and wool into thread using these implements as well as a swingling knife, wool cards, a wool wheel, and a clock reel. Early Rehoboth residents made their own linen and wool cloth for everyday items, such as bedding, towels and work clothing, since buying imports from England was costly and therefore reserved for fine apparel. Most commonly, townspeople chose linen, which was made from easily grown flax plants and held up to much wear. Production, however, was time-consuming, involving up to twenty separate steps. In that process, the breaker broke up the hard outer stalk of the plant. The hatchel straightened and cleaned the interior fibers, separating the long and short strands (each used for a different purpose). Finally, the wheel, much smaller than that used for wool, spun the fibers into thread.